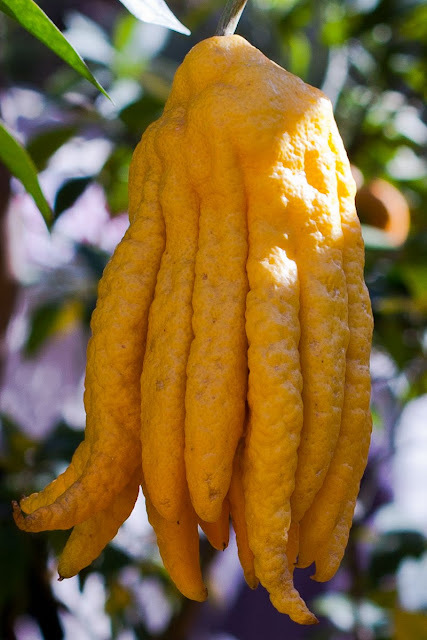 It looks like an anomaly of nature, doesn't it but in fact this lemon, known as the Hand of Buddha (Citrus medica var. sarcodactylis), is one of the oldest members of the citrus family. Although it smells strongly of lemon, it has no juicy pulp hidden beneath its rind. Instead, the Buddha’s Hand is grown commercially for its powerful zest. The aromatic rind is used to flavor lemon liqueurs and specialty vodkas, and provides aroma to lemon-scented cosmetics. Chinese and Japanese households use it to perfume their rooms and personal items, such as clothing. It even has a place in some religious ceremonies in buddhist temples. According to tradition, Buddha prefers the "fingers" of the fruit to be in a position where they resemble a closed rather than open hand, as closed hands symbolize to Buddha the act of prayer. And you can buy this tree at the Fete du Citron in Menton. 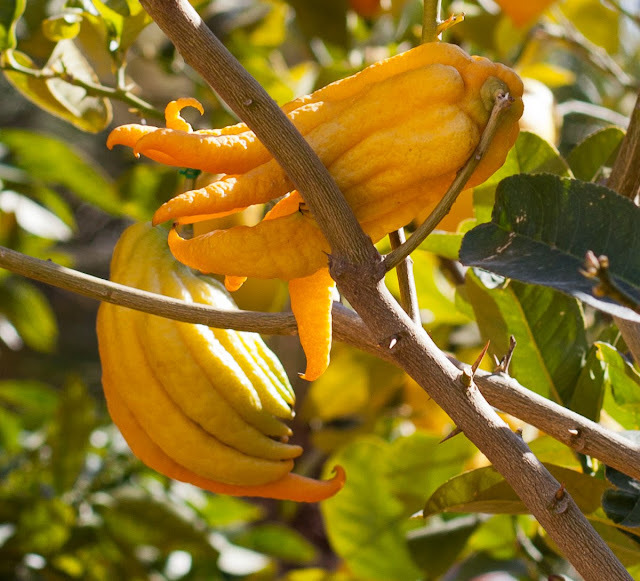 Cela ressemble à une anomalie de la nature, n'est-ce pas, mais en fait, ce citron, connu sous le nom de La Main de Bouddha (Citrus médica var. Sarcodactylis), est l'un des plus anciens membres de la famille des agrumes. Bien qu'il dégage une forte odeur de citron, il n'a pas de pulpe juteuse cachée sous son écorce. Pour cette raison, la Main de Bouddha est cultivée commercialement pour son zeste puissant. L'écorce aromatique est utilisée pour les liqueurs au citron et les vodka spéciales, et elle fournit un arôme au citron pour les cosmétiques. Les ménages chinois et japonais l'utilisent pour parfumer leurs chambres et des objets personnels tels les vêtements. Elle a même une place dans certaines cérémonies religieuses dans les temples bouddhistes. Selon la tradition, le Bouddha préfère que les "doigts" du fruit soient dans une position fermée plutôt qu'une main ouverte ,les mains fermées symbolisant pour Bouddha l'acte de la prière. Et vous pouvez acheter cet arbre à la Fête du Citron à Menton. Live and learn, I had no idea about this. a beautifully informative post. thank you, jilly. I'm with Steffe! It's not all that appealing but I think I'd like the scent of it! Your photographs make it seem like a workl of art. If those were his fingers I would think "creepy." How about those rubbing your back in the dark of night? Yep. Go to Amazon.com and type in Pet's Heated Water Dish. They do look creepy. I saw lots of these in India. This is a strange and rather unappetizing looking citrus. I'm pleased to know that there is a real use for them. This is all news to me. But, it is also one reason I enjoy looking at blogs from around the world. Look what we learn! What a funny looking fruit - never heard of it - thanks for the introduction to it. 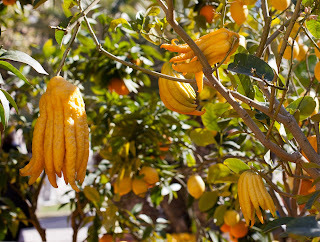 I'd never heard of the Buddha's hand either. How amazing ! That's a lot of rind indeed, how very convenient for flavoring. Your photos are excellent.